In Maxima Tutorial 1, we have discussed how Maxima can be used to perform numerical computations. In this tutorial, we are going to enumerate some of the capabilities of Maxima to perform symbol manipulation. Note than in each equation below, do not forget to press the ENTER key after the semicolon. Assigning values to variables and using them in computations. In a, we used the colon sign to assign values to p and q and assign them as the value of r in b. In c, we solve for the 2x = 3 for the value of x. In d, we use * for multiplication, and ^ for exponentiation. The ratsimp command simplifies expressions. Figure 1 – The Maxima command line. In a, we solved for the values of x and y in the systems of linear equation and . In b and we defined two equations, eq_1 and eq_2, then used the two variables in d.
Figure 2 – Graph of sin(x)/x. Figure 3 – Graph of (sin(sqrt(x^2 + y^2))/sqrt(x^2 + y^2). Maxima is free a computer algebra system capable of a variety of computations. It can manipulate symbolic and numerical expressions, as well as perform differentiation and integration. It can also manipulate Taylor series, Laplace transforms, ordinary differential equations, systems of linear equations, polynomials, and sets, lists, vectors, matrices, and tensors. Maxima can perform high-precision computations as well as plot two and three-dimensional graphs. In this tutorial, we are going to learn how to use Maxima to perform basic numerical computations. 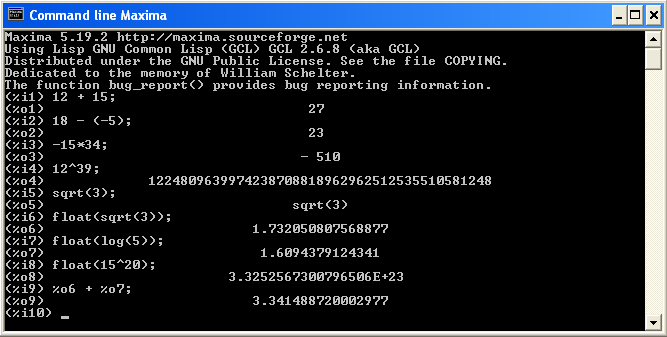 To perform simple numeric computations, we need to open the Command line Maxima as shown in Figure 1. 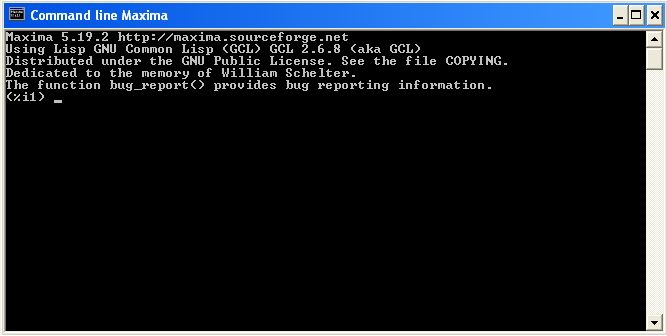 The Command line Maxima is similar to the DOS-prompt as shown below. We just have to type the expression, the press the ENTER key. To add 12 and 15, type the following 12 + 15; and press the ENTER key on your keyboard. Note that each computation, command or expression ends in a semi-colon. The (%i1) text means first user input and the (%o1) means first output. After pressing the ENTER key, your first output should be 27. After typing sqrt(3) and pressing the ENTER key, your screen would look like the one shown below. Notice that what when we typed sqrt(3), the output is also sqrt(3). That is because, Maxima also accepts expressions like fractions and radicals without simplifying them. To simplify an expression into a decimal number, we need the float command. The float command converts fractions, radical expressions and other expressions to decimal numbers. Figure 3 - Maxima accepts fractions and irrational numbers without convering them to decimal numbers. Figure 4 - Maxima can handle very large numbers as shown above. We can also perform operations of previous inputs and outputs by typing their corresponding prompts. The command %o6 + %o7; added the value in output 6 and output 7. 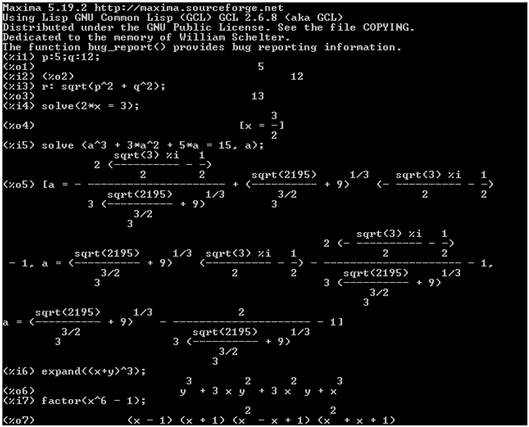 Maxima has also mathematical constants stored in the program. So computations like pi*r*2 is possible. In Maxima Tutorial 2, we will discuss how to use Maxima to help us perform symbolic manipulations.